The difference between these giant gummy bears and the others is these are 3 different flavors in one gummy bear! 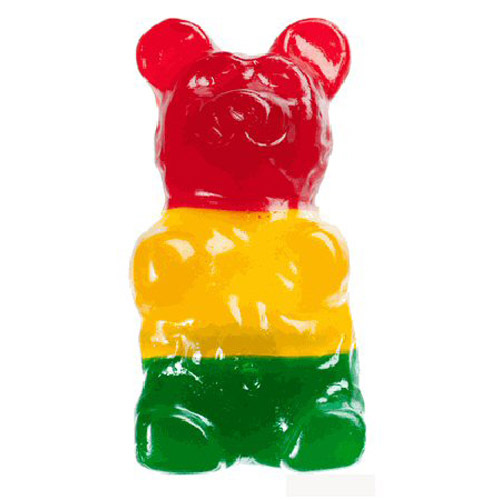 You can choose either the Giant Gummy Bear (1/2 lb.) or the Giant Gummy Bear on a Stick (1/2 lb.). The astro flavor is the combination of cherry (head), lemon (middle) and lime (bottom). Each bear is made right here in the U.S. and is gluten free. The word "giant" is a bit misleading on this item. Yes, it is indeed much bigger than a regular gummy bear but the word "giant" had me thinking it was like 10 inches tall or something. It is only 4 1/2 inches tall. It's my own fault that I didn't research the size more thoroughly but the item was a disappointment based on my expectations. It has taught me to not be so hasty when trying to get a birthday present ordered quickly. I hope my niece isn't terribly disappointed because I believe her expectation is that it is truly a "giant" gummy bear. I would label it "extra large" instead of "giant". COMMENT From CandyMachines.com: Thank you for the feedback. We will forward to our web team to see if they can provide more visuals of the actual size. We do have the "World's Largest Gummy Bear" which is closer to the size you were looking for weighing in at a full 5 LBS and approx. 10 inches tall!